A clinical trial for a Minnesota company's treatment for lower-back pain is going so well that Relievant Medsystems has opted to offer the treatment to everyone in the control group. Wolves guard Jerryd Bayless, an NBA veteran of 11 years, will soon have his college diploma. The Gophers women's hockey team ranked No. 1 in the regular season for first time since 2015. An ordinance that would require Minneapolis homeowners and landlords to disclose how much energy leaks out of their properties moved closer to enactment Monday. Poll: Grade Minnesota's new tourism slogan, "Find Your True North." Paul Douglas forecasts a couple chances for plowable snow this week. Former Gophers softball catcher Kendyl Lindaman took advantage of new rules in the NCAA's "transfer portal" to be eligible to play at the University of Florida, Pat Reusse writes. Federal prosecutors in New York issued a subpoena Monday seeking documents from Donald Trump's inaugural committee. The price of a new house “far exceeds what buyers paid years ago, even adjusting for inflation,” said David Siegel, executive director of a Minnesota builders group. Kristian Williams decommits from Gophers football team. A North Texas man was killed when an e-cigarette exploded in his face, the medical examiner said. Lindsey Vonn to race early Tuesday morning at the Alpine world championships in Sweden. Ecolab will spin off its $2.4 billion oil-drilling chemicals business into a separate public company. U.S. Customs and Border Protection is preparing to begin construction of more border barriers in South Texas' Rio Grande Valley, likely on federally owned land set aside as wildlife refuge property. "They show up ready for their job”: Kids try out new $20 million financial learning labs in St. Paul. Lovell Tims, a wise and watchful shoeshine man in downtown Minneapolis, has died at 74. Queen Elizabeth remained in Buckingham Palace during World War II, despite grave fears for her safety. Yet according to British media, the royals are to be secreted away if a no-deal Brexit scenario incites riots. Atlanta artists are responding in force after a mural featuring embattled former NFL quarterback Colin Kaepernick was turned to rubble days before the Super Bowl. Residents in a Yorba Linda, Calif., neighborhood were getting ready for Super Bowl parties Sunday afternoon when terror came crashing from the sky. Jurors have convicted a 32-year-old man of participating in a robbery spree at auto parts stores around the Twin Cities. Review: Yellow Tree Theatre's new "Flowers for the Room" musical is too jumbled to jell. A jury began deliberations at the U.S. trial of Mexican drug lord Joaquin "El Chapo" Guzman. Prosecutors are researching an appeal after a Kansas judge called two teenage girls the "aggressor" in a sexual encounter with a 67-year-old man and eased his prison sentence. 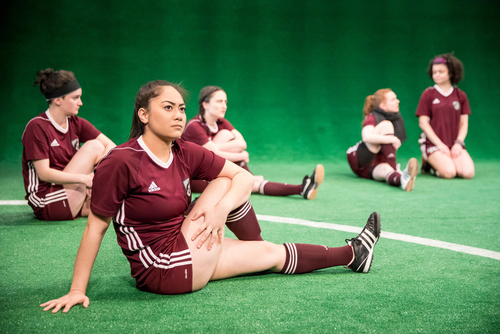 Review: Jungle Theater's "Wolves" comes back stronger for second Minneapolis run. A prominent St. Paul attorney remains under police investigation nearly a year after prosecutors declined to charge him in a traffic crash that killed a man out for a walk. A church that hosts a daytime drop-in center for homeless and lonely people appears poised to settle a lawsuit with St. Paul over restrictions the city had placed on the center. Minnesota DNR Commissioner Sarah Strommen has named most of her leadership team. Wisconsin-based Tyco Fire Products knew its toxic products were contaminating groundwater at least four years before notifying residents, according to state records. All after-school activities for Minneapolis Public School students have been canceled for Monday afternoon because of the weather. President Donald Trump is nominating acting Secretary David Bernhardt, a Washington veteran with lobbying ties to U.S. energy companies, to lead the Interior Department. A North Carolina regulatory board says it will look into accusations that an oral surgeon sexually abused at least four patients while they were under anesthesia. New Jersey became the fourth state to boost its minimum wage to $15 per hour. The measure would phase in the higher rate over five years. Kristian Williams, a defensive tackle from Memphis, decommits from Gophers football team heading into Wednesday's national signing day. 'Intensive parenting' proves exhausting (and expensive) for today's parents. Historians escalate their fight against Hamilton's portrayal in 'Hamilton,' with one writing a play of his own. Hennepin County Medical Center has already had more than 30 people come in today with back, head, hand and leg injuries from slipping on icy sidewalks and driveways. For Trump's State of the Union address, New York Rep. Ocasio-Cortez is bringing as her guest a woman who confronted a GOP senator in an elevator during the Kavanaugh hearings. The city of Dayton’s mayor is accused of with embezzling thousands of dollars from a citizen committee in charge of the west metro suburb’s Heritage Day celebration. “He lived behind the drums, and he died by the drums,” said Steve Ghizoni, bandleader of the Rockin’ Hollywoods, with whom Doug "DJ" James was performing Jan. 25 when the drummer died of a heart attack on stage at Mancini’s. The U.S. is about to begin construction on 33 miles of border wall and fencing in Texas with $600 million appropriated by Congress last March. Six French women are on trial, defendants in a defamation lawsuit brought by a former lawmaker they accused of sexual misconduct 1½ years before the #MeToo movement. College basketball team scores 200 points, but is this the right way to do it?